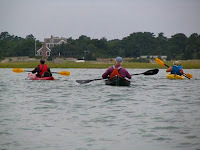 The summer of 2010 is off to a great start here in Sandwich. The weather is beautiful with warm days and cool nights. What more could you as for when you’re vacationing on Cape Cod? 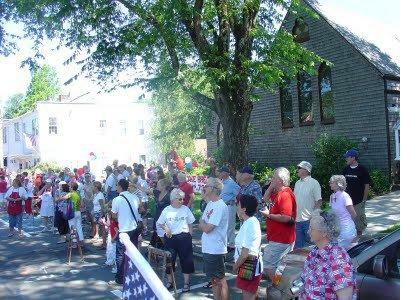 It is hard to believe that it’s almost July 4th, but it’s still June and Sandwich has an abundance of events to entertain visitors and locals. On Friday, June 25th, Heritage Museums & Gardens is premiering a new exhibit featuring the works of Frank Vining Smith (1879 – 1967) who lived and worked in Hingham, Massachusetts. An avid sailor, his works are informed with an authentic appreciation for the sea and its' ships. Inspired by his love of the sea, he became known as America’s finest marine painter, gaining the critical and monetary success seldom achieved by artists. As some of the works in the exhibit are from a private collection, this could be your only opportunity to see them. The following Sunday (June 27th) at 2:00 pm, James Craig, author of Frank Vining Smith: Maritime Painting in the 20th Century, will be at the museum to share his insights about this prolific artist. You can purchase a copy of his book on site and he will be happy to sign it for you. On Saturday, June 26th from 10:00 am until 4:00 pm on the lawn of the Sandwich Public Library, there will be a juried show and sale featuring twenty of the region’s finest jewelry artisans. Unique creations in silver, glass, mother of pearl, vintage buttons, semi-precious stones, and much more will be available for sale. Pick up a memento of your visit to Cape Cod or a gift to delight someone special. Also on Saturday, June 26th, the Dexter Grist Mill is opening for the season. 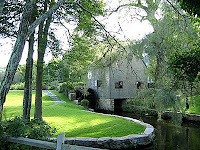 The restored mill is just across the street from our Cape Cod Bed and Breakfast, and dates back to 1654. 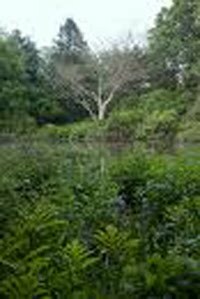 Corn is still ground there using the mills' centuries-old gears and the oak waterwheel driven by water flowing from Shawme Pond. You can even buy a bag of ground corn to take home with you. We use corn meal ground at the mill in our Rosemary-Roasted Corn Muffins that we serve for breakfast at the Inn. The mill and its’ resident swans are perhaps the most photographed scene on the Cape so, bring your camera. 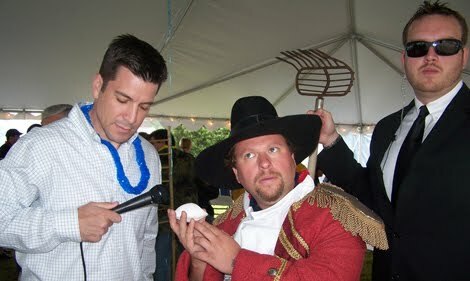 Monday, June 21, 2010 is not only the first day of summer, its Quahog day on Cape Cod. Doug the Quahog shows himself and makes his prognostication about how many weeks of beach weather we will have on Cape Cod this summer. This is the second of what is becoming a popular annual event here on the Cape, and we are excited that it is being held in Sandwich this year. Although we are a bit dubious about the accuracy of the little bi-valve’s predictions, it will be lots of fun for those attending. The official ceremony will be held at 4:00 pm at Hemisphere Restaurant located on Town Neck Beach in Sandwich. 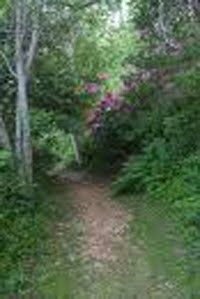 There will be live music by Black Wampum and free samples of “Doug’s Mud” ice cream, named in honor of the little Quahog and generously provided by Polar Cave Ice Cream. A 50-50 raffle will be held at the event with proceeds going to the National Marine Life Center in Buzzards Bay. Don’t know what a 50-50 raffle is? You should come and find out. If you win, you could go home with a little something extra in your pocket! Quahog Day is the beginning of a week-long celebration of a very welcome summer season with “quahog” activities all over Cape Cod. If you go to Clancy’s in Dennisport, tell your server “I Love Doug the Quahog” and receive two delicious Quahogs for the price of one. Catch of the Day in Wellfleet will offer a Quahog Day special featuring Homemade Quahog Pie paired with Cape Cod Beer's Cape Cod Red. And, you really shouldn’t miss the Stuffed Quahog eating contest at the new Quahog Republic Dive Bar in Falmouth on Wednesday, June 23rd. It’s not all about the food. From June 21st through June 27th, Atlantic Spice Company of North Truro, home of the Fantastic Clam Ram, is offering a one-pound bag of Bay Spice Powder with the purchase of a $15 Clam Ram. Cape Cod Beach Chair is having a week-long sale at their new store in Harwich; bring in a quahog shell and receive 20% of your purchase. By the way, their beach chairs are a must-have for the summer. 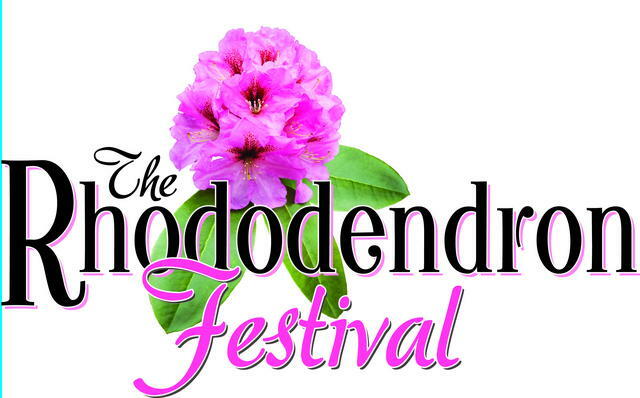 To round out the week, attend the annual Chowder Fest at the Cape Cod Melody Tent in Hyannis. While you are there, check their 2010 Summer Schedule and pick up some tickets to attend a live performance. 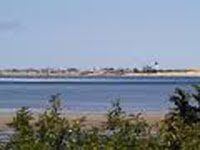 Whether you are planning an extended vacation or a quick get-away to the Cape this summer, we would love to have you stay at our Cape Cod B and B. We’re going to have a great summer…come join us. Guests who stay at our Cape Cod Bed and Breakfast continue to enjoy the Australian 2005 Formula - Robert’s Shiraz, by Small Gully Wines, and the Italian 2008 Mascialrelli Rose d’Abruzzo. One recent quest was in the habit of returning from dinner and having a glass of the Formula, almost like a port. The Formula is bold and high in alcohol, so I guess it hit the spot for him. 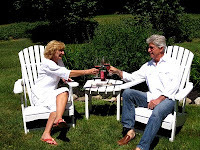 In my June 9th wine blog I shared news of some of our wine loving returning guest. Having guests return is part of the fun of running an Inn. Another wonderful part is meeting new guest from around the world. Early in the season we are not always completely full midweek. With our prime location in the heart of Sandwich Village, we often have walk-ups looking for last minute accommodations. Young Europeans frequently travel without booking ahead. This week we had a wonderful young Spanish couple, who were visiting Cape Cod on their honeymoon, walk-up late in the evening. I called the Painted Lady and asked them to hold the kitchen open for Oriol and Nuria who were staving after a full day of exploring the Cape. Over breakfast the next morning, the conversation drifted to wine, as it often does. Our Spanish guests asked about my experience with wines from their country. Although I have limited knowledge of Spanish wines, I had just the day before brought up form my cellar one of the few Spanish bottles I had, with plans to taste it again. My 2007 Els Pics Priorat from Bodegas Mas Alta was obtained last summer at a tasting of Spanish wines on the patio at the Brown Jug. Jan really liked this wonderful Grenache blend and this was the last bottle in my cellar. Upon seeing the bottle, Nuria became very excited and, in her excellent English, explained they knew it well and that they lived very near the vineyard. Nuria insisted on having a picture taken with Jan and myself holding the bottle of wine. I call that a ‘small world of wine’ happening. I speak no Spanish and they were not completely fluent in English, but we found a common language in the wines we both enjoyed. Just one more reason for me to continue to seek out and enjoy wines from around the world so I am ready for my next international guests. The wines we are serving this week are a repeat of last weeks. The same international flavor with the Australian 2005 Formula Robert’s Shiraz by Small Gully Wines and the Italian 2008 Mascialrelli Rose d’Abruzzo. See last week’s blog for my comments about why I select these two wines. The bigger question is why we did not serve them last weekend and what did we drink at the Inn. A great joy of running an Inn is to see returning guest, especially if they are a winemaker and bring samples of their craft to share. 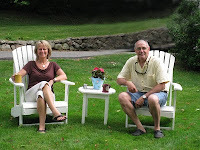 Our often-repeating guests, Lynne and Kevin from Canada, graced us this weekend with their presence. Kevin has been making wines for a number of years and always brings me his latest vintage to cellar until his next stay. Joining them was other returning guests, Priscilla and Bob from Saratoga, NY. The four had been here before at the same time and all enjoy wines. We spent much time on the patio, aka Wine Patio, exploring Kevin’s handcrafted wines and a wide selection of others, but never made it to my selections for last week. Kris and Dave from Cellar 55 joined us to add their ‘professional’ opinions to this special tasting. The consensus was that Kevin’s 2004 Shiraz from my cellar was at it peak and was enjoyed by all. Do all wine’s taste better when shared with the proud creator of that wine? I look forward to Lynne and Kevin’s next visit, which will be the right occasion to open Kevin’s 2010 Pinot Noirs that are now maturing in my cellar. So, last week we made a little detour from my planned wine tasting, but a lot of other great wine was still enjoyed. We now have last weeks’ selections to look forward to this week. Another win-win on the Wine Patio. My blog may be a day late, but not a dollar short. I was occupied yesterday by my continuing quest to find the right wine for this week’s offering at our Cape Cod Bed and Breakfast. In fact, I was at a tasting last night at the Belfry Bistro on its' beautiful terrace, the perfect place for a late afternoon glass of wine, or two. The tasting was all Australian and all red. David from Cellar 55 Wine Merchants shared four Shiraz in the big and bold style that many of us wine fans consider to be Australia at its best. So for this week’s red, I am going with the 2005 Formula Robert’s Shiraz from last night’s tasting. Last year I had the 2004 and, I am pleased to report, the 2005 is just as good, or better. The wine is from the Barossa Valley in Southern Australia and produced by Small Gully Wines. It is not for the faint of heart with an alcohol content of 15.9%, maybe that’s why I like it so much. A little goes a long way. I was so excited with the reds, that I am not offering a white this week; I am staying sort of red with a light and refreshing Italian rose. The 2008 Mascialrelli Rose d’Abruzzo is 100% Montepulciano grapes form the Abruzzo region. It’s a great summer deck or patio wine. I have gone a little international this week; let’s see how my guests like these selections.